Since 1993, LKOC has been presenting its annual “I Love Kailua” Town Party fundraiser in downtown Kailua. This is a street fair featuring a "Taste of Kailua" local food vendors, arts and crafts, plant sales, educational booths, and lots of entertainment for all ages. It is our chance to give back to the community that has supported our mission over the years. The event is our major fundraiser each year, where all funds generated go towards our various beautification and outreach projects in Kailua and on the Windward side. To read more about what we do, please visit our History, Accomplishments, and LKOC Projects web pages. ​MAHALO TO OUR GENEROUS 2019 SPONSORS! please fill out the contact form at the bottom of this page, and we will get in touch with you. As a sponsor, your name will be acknowledged in all promotional material associated with the event, as well as prominently displayed throughout the event venue. Keeping Kailua Clean, Green, and Beautiful! Thanks to all who requested having a booth at the 2019 Town Party this year. We have filled all our spots and are so grateful for your participation! Here's a snapshot of our 2019 event! And a Huge Mahalo to our emcees for the event, Curt Williams and Kit Beuret! ​As part of our fundraising effort for the Town Party, prior to the event, and at the event itself, we sell commemorative Buttons which offer discounts at various local merchants around Kailua. Here’s a sampling of our 2018 discounts. The Town Party is held on Kailua Road. Here’s a map of the area, for our 2018 event, which will be updated as our 2019 event nears. EVENT DAY ROAD CLOSURE ADVISORY: The event will close all traffic lanes/sidewalk areas on Kailua Road on April 29, from Hahani St. to Kuulei Rd., fronting Whole Foods, Longs and Kailua Shopping Center. Traffic will be diverted from 9 a.m. to 5 p.m. Please plan accordingly. Three floors of parking will be available in the lot fronting Longs. Enter from Hahani Street, near Teddy’s Bigger Burgers, or Hekili Street. Town Party organizers encourage Kailua residents to leave their cars at home and walk or bicycle to the pedestrian-friendly event. For information on the bus schedule, please contact 848-5555. Click below to see the 2018 Town Party Non-Profit Application Information Form, describing the rules and regulations for event participation, the Non-Profit Application Form itself, which details those rules, and the City and County of Honolulu Fire Safety Guidelines regarding Street Closures, Block Parties, and Special Events. By signing the Application Form, the applicant agrees to abide by the rules. All of our event participants must sign similar forms, including our Crafters, Artisans, and Food Vendors, wherein different rules may apply, based on the nature of the activity. All four forms are available upon request. In 1992, LKOC President Rusty Kunz had big plans for ‘fixing up” Kailua, starting with Alala Point, better known as Lanikai Point. After talking to the powers that be here in Kailua at the time, she approached Kaneohe Ranch and landscape architect, Steve Mechler, and decided she needed $100,000. Kaneohe Ranch said that if we (LKOC) could come up with $50,000 they would match it. What to do???? Rusty came up with the idea of having a Kailua Town Party and ergo “I Love Kailua” was born!!! Our ﬁrst event was held on Valentine's Day, 1992, thus the name “I Love Kailua”. It was held in the parking lot behind Mike McKenna Ford and First Hawaiian Bank, and extended from where Longs is now to Hekili Street, and to where the old Foodland was. We had about 15 restaurants, 40 crafters, 12 non-proﬁts and 4 wonderful entertainers including Puamana, who has continued with us over the years. The entertainers all performed for free which was a wonderful thing for them to do (and they still do today). As mentioned, our ﬁrst event was held on Valentine's Day, but due to the fact that the 14th of February was the restaurants’ busiest day of the year, we decided to change the date to March, then April in the ensuing years. Easter kept changing and so did we. We had 3 entrances: one between Mike McKenna and 1st Hawaiian Bank, one at Hekili Street, and one between Long's and the building where Brent's Deli was. At that time, buttons were required as an entry fee and children under 12 were free. This was one of LKOC’s major sources of income back then. But we can't do this anymore since we have moved the party to public property. We now call the button purchases ‘donations’. At the party, the money was counted on the desks of Mike McKenna's upstairs ofﬁces, and wow, what a job that was! Money was all over the place and it just kept coming and coming. All the script counters were up there too and you could sure tell when they were counting the scrip from Agnes's Bakery... sugar all over the place! All the restaurants had to decorate their booths and were judged on that. Though they looked great, it took too much time, so we discontinued that, but they still sell great food!! For that first event, Rusty and the gang sat up all night guarding the booths and tents and lots of other things. The week before the event a lot of LKOC volunteers went around to the different neighborhoods to pass out ﬂyers telling of our big party. We even set up the old gin and ti leaf offering to appease the spirits and have them shine down upon us!!! Everyone just winged it because we had no idea how many, if any, would come. We had no idea how many buttons to make, how much scrip to print and how many T-shirts to create. But we did have one real seller up our sleeves. Rusty had cleverly managed to buy up some 10,000 POGS at the height of the fad for those crazy milk cap covers. Do you remember? The kids went nuts and the parents went broke buying them up. They turned out to be the hit of the day that's for sure!! It turned out to be a beautiful party and did the people come... by the hundreds. We ended up netting around $35,000 and with a $25,000 donation from Muriel Flanders, we reached our goal of $50,000! That was the ﬁrst of our many projects that were paid for by the “I Love Kailua” Town Party and Kaneohe Ranch, who's been our sponsor ever since, until now, where Alexander and Baldwin continues that generous tradition. Until 2003, we used the private parking behind First Hawaiian Bank. It worked out well for us; some years we made a lot of money and some years not so much, due to rain, T-shirt design and sometimes conﬂicting events like the Waimanalo Fair. At some point, folks started bringing their dogs and then our party turned into a real family event. The dogs were all well behaved and ergo not a problem. One year a young man bought a button to get in, and with him was a huge Great Dane ...he should have gotten a button for him too! He didn't think it was too funny, but we let him have a good day and hoped his owner could afford his food bills! One year we asked Nadine Kam, a local food critic, to judge, but since it was our policy that everyone had to win something, she never came back...not her style I guess!!!! Our event just kept getting bigger and bigger, and we felt we needed to get professional help and change the location...but who and where??? After much discussion and meetings, we hired Amy Hammond, owner of Special Events Hawaii, and she and our House Representative, Cynthia Thielen, came up with the idea of closing down Kailua Road. What a job that ﬁrst closing down a public street became. LKOC was the ﬁrst non-proﬁt to do such a thing for such a long time, and from the number of police ofﬁcers we had to have that ﬁrst year in 2004...you'd have thought we were putting on something as large as the Pasadena Rose Parade. No one in the C&C knew how to do such a thing... We ﬁnally had to go up as high as the mayor to get the ﬁnal approval. We did get it approved, and with the help of Kaneohe Ranch, we created our First Street Town Party, and what fun it turned out to be! Kailua Road between the Kailua Central triangle and the Hahani Street intersection was shut down at 9:00 AM and reopened to cars at 5:00 PM sharp. A huge ﬁne would have been imposed if we had been a second late. We added more restaurants, more crafters, the original non-proﬁts, a bigger plant area, more room for the kids play area, more T-shirts, and more entertainers. 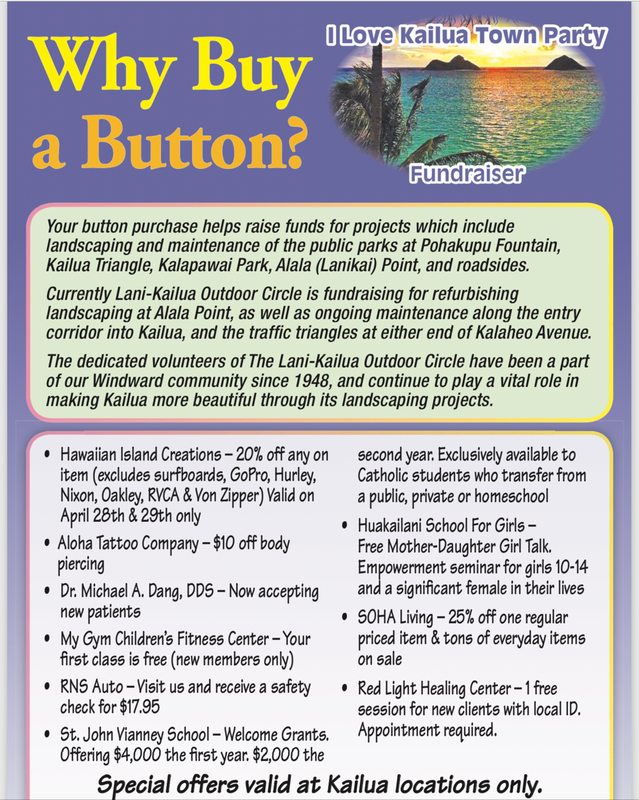 However, we could not charge people an entrance fee since we now were on public property, so our buttons became a donation to “Make Kailua: Clean, Green and Beautiful”. We were very lucky that some businesses offered to give a small discount to those customers who wore a button. We had some interesting years...one in particular was when the toilet company missed the date by one week! When we realized they were not coming, we had to literally beg all the businesses along the route to be kind enough to let our party goers use their facilities. Early on after the ﬁrst couple of parties, we realized we had to have some ground rules. We decided that we would provide the food vendor plates because we needed the restaurants to keep their portions the same size so they could charge the same # of scrip. One time we had three pizza restaurants, and had to get after one for serving gigantic slices. Can you guess which one? It was Boston Pizza and they were famous for always having those giant pieces. We had to re-train those guys to really cut down on their servings! Also our party was extremely popular to all the politicos, especially during election years. We always sent special invitations to the Governor, Mayor, Legislative members and City Council members from our district. Those who were in seated positions were able to say hello and tell LKOC how wonderful we were and how neat Kailua was, but absolutely no politicking allowed. Those who were on the campaign trail were allowed to come in and talk with folks, but no passing out information, and no TV cameras or personal mikes to start campaigning. During one of our last events held on private property, Ed Libby, who was a young 85 years old, and our Town Party chairperson, had to face up to one candidate who came in with the biggest entourage we'd ever seen, carrying huge TV cameras and mikes!!! Ed had to tell this fellow he could not turn our event into his own campaign party, and they all had to buy buttons and behave themselves. You didn't fool around with this retired Air Force Colonel...he shaped them up very quickly!! But, for all the 25 years so far that LKOC has put on this party, we've never had too much trouble. We only caught one guy trying to pretend he was one of the scrip collectors, but the restaurant he was trying to scam was too smart to buy his act. One year we had a man dressed up like Captain Kidd holding a huge paper mache shark. He said he was taking pictures for free of kids. Of course we didn't buy that baloney, and our men in blue had him walking the plank to the outside in no time. 2012 marked our 20th year and though every year it gets more and more expensive, and our net proﬁt shrinks, Kailuans would hate to see the party end. In 2011, we probably had some 6000 people and 100 dogs come. We had around 60 crafters with a waiting list of 360. We had 23 restaurants, and a new group called “Art in the Park”, for Kailua's artists. We had 3 scrip and button booths, manned with 45 volunteers (who think they are grandfathered in and would never give up their services). We always have about 30 people who work the set up and take down jobs...not an easy job since the street has to be cleared and cleaned by 5:00 and the party ends at 4:00. First Hawaiian Bank, who's been with us since the very beginning, does all the money counting and we have 10 or so scrip counters, plus all the volunteers that work at membership, scrip pick up, money pick up, T-shirt and plant sales, and many more who work their hearts out for one day. We’ve had Mike Perry as one of our emcees since the very ﬁrst one in 1992, and later on we had Kit Bueret join up to emcee the second half of the center stage activity. Our plant section has gotten larger, and if we can get our plant providers from getting snatched by Thomas Square's plant sale the same day we'll be in great shape! In 2012 we started inviting local artists of Kailua to come up with a design for our T-shirts and buttons. That has been a great success, and in 2017, (our 25th year!) our artist generously donated the original painting used to a lucky attendee during a special drawing at the Town Party itself. Our button sales have been a big success as well, and folks collect them as souvenirs. Having all 25 of them is a big coup! Looking Ahead ~ The Next 25 Years! 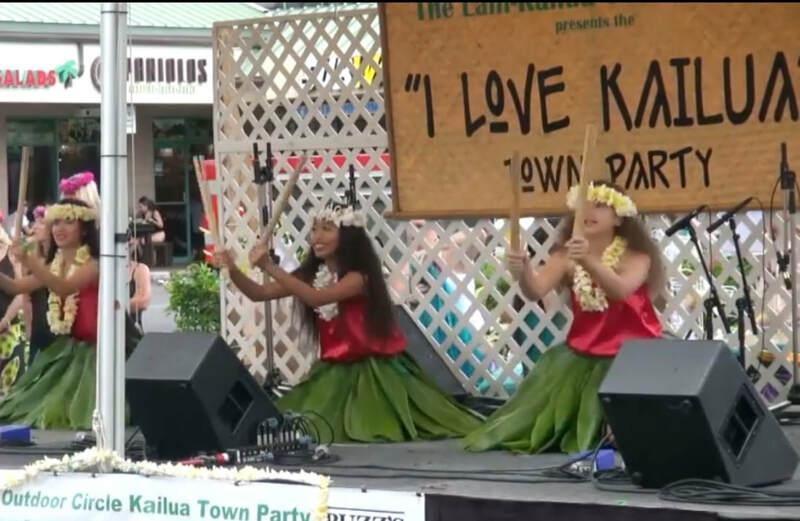 LKOC has been presenting the “I Love Kailua” Town Party for 25 years. This event celebrates Kailua, promotes our local businesses, and instills a sense of pride in the community. It also takes a huge investment in time and money to be a success. And success means LKOC can continue its beautification and educational outreach in the community. Over the years, our fixed costs keep rising, and for the past few years we have been fortunate enough to have local businesses and individuals contribute as sponsors for the event, to offset some of these costs, such as the rental of stage and sound equipment, tent rentals, hiring of security and traffic control, and rental of public restroom facilities. Their generous support has led greatly to the success of the event. In particular, in recent years, Alexander & Baldwin Properties has been extremely generous in providing both financial and background support. If you would like to be a sponsor, we offer public recognition of your generosity in a variety of ways, in our promotional materials for the event, at the event itself, as well as on our website and social media platforms. Plus, think how GREAT you will feel to be a major player in YOUR community! We hope you will join us next year. It promises to be great! Be a Town Party Sponsor!